Perhaps the most useful gift item and a thing of utility for the parents, a baby sling or front carrier makes it extremely easy for parents to carry their child with them while they attend to daily chores at the same time. Babies love the warm snuggled feeling from being so close to their parent and the parent is rendered free with both hands to do other work while the baby sits comfortably in the pouch. Gift a bag full of daily essentials for the baby. You can include a diaper bag, wipes, outfits, feeding bottle, small toys such as rattles, pacifier and much more. Parents need these items more often than one can imagine for the child. Grab a practical baby tub and fill it in with items that the parent will need to keep the baby clean. This can include shampoo, soap, washcloth, hooded towel, bath comb and perhaps a rubber duck. Gift items for the baby’s sleep time to the parents. Soft sheets and fuzzy blankets are perfect to include in this gift set. Every parent needs these things for the baby’s bedding. Keep the baby happy by gifting the parents a bouncy seat or motion chair for him in which he can play and swing to his content. These are perfect for the child’s entertainment and are practically safe for the child as well. Children are often in the habit of throwing away their shoes and footwear. However these are necessary to protect their feet anyhow. You can gift a pair of comfortable and soft booties for the child which he can wear with comfort. A cot can prove to be a very useful and ergonomic gift for the child as well as for the parents. Carrying around the child outside the protection of home becomes a lot more easier when the child is comfortably seated and belted in his cot. You will find plenty of ready kits in the market with essential personalized baby clothes. Parents will always need extra pairs of clothing for the child and your gift will be a pleasant addition for them. 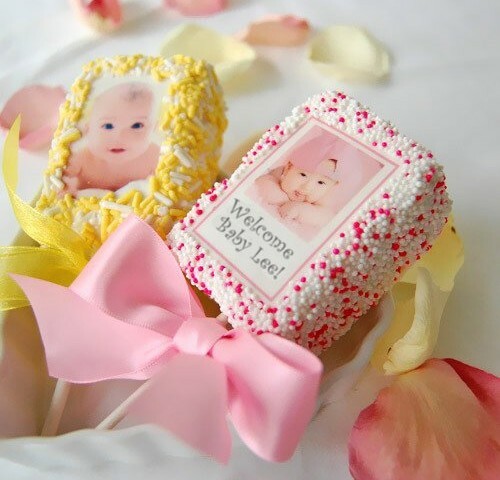 Moreover, you can experiment with colours and patterns of your choice for the baby. A sleep kit for the baby is yet another ergonomic gift both for the parents as well as for the child. Fill in the kit with a blanket and perhaps some soothing music or lullabies for the child to help him sleep. Illustrated and graphical books with soft edges can become a baby’s best friends from his earlier days itself. Gift some classics at the baby shower.